MS309 CAN OBDII Code Reader provides easy and quick access to Diagnostic Trouble Codes for all OBDII compliant vehicles sold worldwide since 1996. It shows code definition on screen. Though small in size, it is powerful enough to retrieve same information as large expensive scanners. 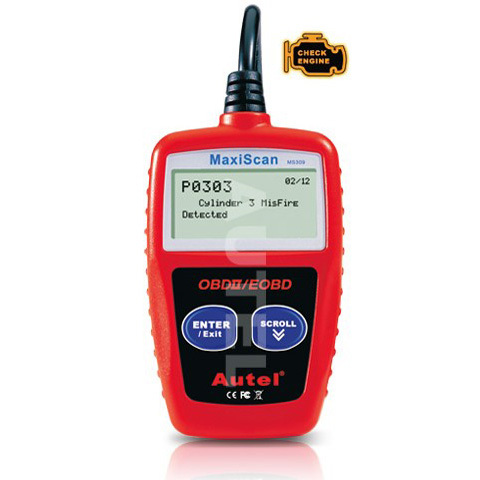 1.Works with all 1996 & later OBD2/CAN compliant US, European and Asian vehicles. 3.Easily determines the cause of the “Check Engine Light”. 9.Bilingual interface & DTC definitions in English or Spanish. 10.Retrieves vehicle information (VIN, CID & CVN). 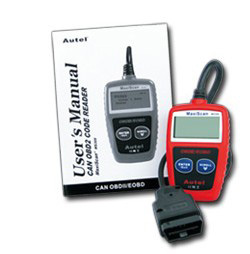 11.Supports CAN (Controller Area Network) & all other current OBD-II protocols. 12.Large easy-to-read backlit LCD screen. 13.DTC lookup software CD included.